It’s time to welcome springtime! We’re celebrating the beginning of spring with a group of our blogging friends with a link party for all things Spring! We hope you’ll join us and share your springtime crafts, diy projects, recipes, and activities. We can’t wait to see all of the inspiration! Tulips and spring go together like mornings and coffee for me. 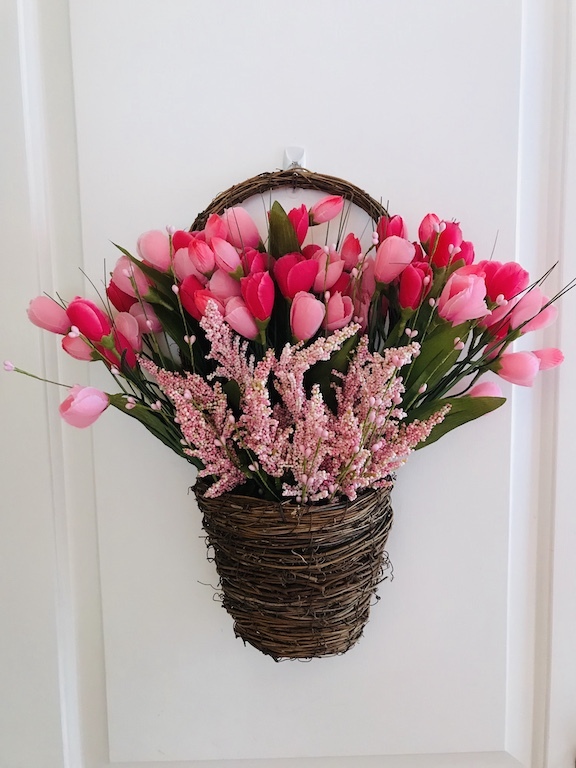 Today I’m sharing a thrift store find that I have turned into a Spring Tulip Basket Door Hanger . You’re invited to share any spring related posts: Crafts, Decor, Activities, and Recipes. If it’s a way to celebrate spring, we’d love to have you share it with us! We’re looking forward to seeing your spring time creativity! We’ll be pinning and sharing your posts over the next couple of weeks. The party is open through April 11 and on April 15 each host will be posting her features, so be sure to stop by for that. Now, it’s your turn! Share your Springtime Creativity with us!